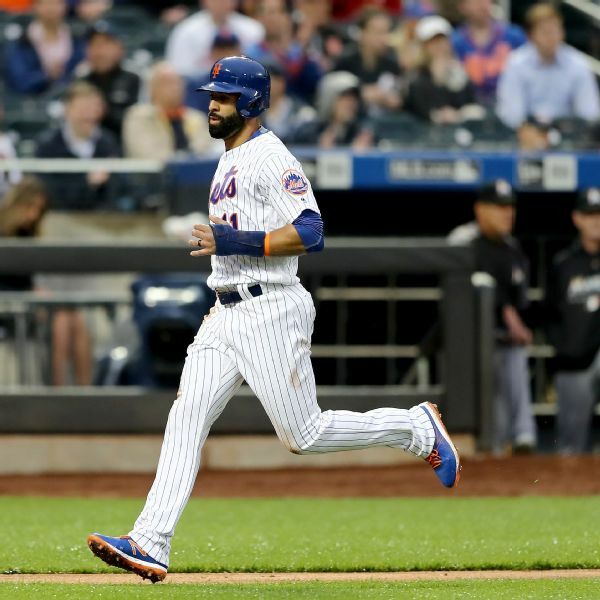 Veteran slugger Jose Bautista went 1-for-3 after signing with the Mets earlier Tuesday. LAS VEGAS 4, TACOMA 0 Syndergaard TACOMA 4, LAS VEGAS 3: Noah Syndergaard limited the Rainiers to four hits in 6 1/3 scoreless innings and combined with Gonzalez Germen on the seven-inning shutout in Game 1 of a doubleheader. SAN DIEGOFIRST PITCH: If the Mets want to be taken seriously in the second half, it sure would help to produce a win Sunday.Zack Wheeler (5-8, 3.90 ERA) opposes Cuban right-hander Odrisamer Despaigne (2-1, 1. First-round pick Michael Conforto reacts after going 1-for-4 in his professional debut Saturday as the DH with Brooklyn.LAS VEGAS 6, SALT LAKE 2: Andrew Brown's three-run homer with two outs in the eighth gave the 51s a 3-2 lead after an error prolonged the inning. BINGHAMTON 11, ERIE 4: Darrell Ceciliani homered twice and Brandon Nimmo also went deep and the B-Mets head into the Eastern League All-Star break a season-high 20 Ceciliani games over . ALBUQUERQUE 6, LAS VEGAS 5: The Isotopes scored three eighth-inning runs against John Church for the comeback win. Jamie Romak hit a solo homer to lead off the inning. ALBUQUERQUE 7, LAS VEGAS 6 (10 innings): Wilmer Flores' second homer of the game, a solo shot in the top of the 10th, gave the 51s the lead. But after inheriting two baserunners from Chasen Bradford with two outs in the bottom half, Buddy Carlyle walked Walter Ibarra to load the bases. LAS VEGAS 9, SALT LAKE 8: Trailing 7-4, Vegas scored five runs in the seventh. Salt Lake produced a run in the ninth and then loaded the bases against Buddy Carlyle, but he retired Luis Jimenez on a pop out to third baseman Josh Satin to end the game. LAS VEGAS 9, SALT LAKE 8 (10 innings): Noah Syndergaaard allowed five runs on 11 hits in 3 2/3 innings as his ERA swelled to 5.70. Josh Satin (2-for-6) delivered a walk-off two-run single to left field with the bases loaded and one out in the bottom of the 10th.